One thing I have challenged myself to do this year is to make a number of cards/projects with one stamp set being the main focus.....this should give you (and me) a good idea of the different ways you can utilise a single set, and help stretch my imagination! Well that's the idea anyway! 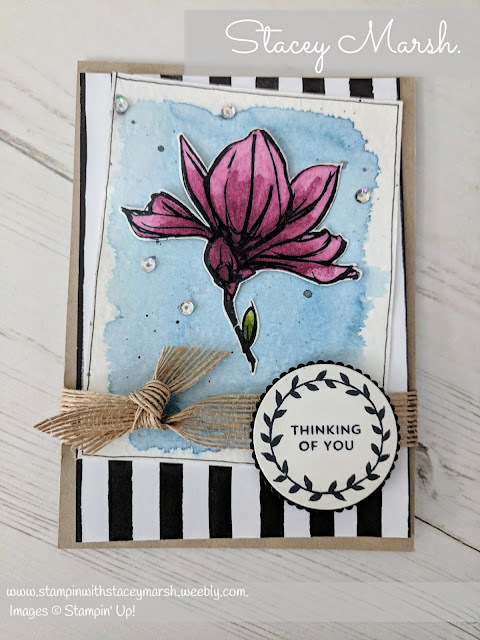 Todays card is using the Remarkable You stamp set which is just gorgeous! You get 4 large stamps and 2 sentiments. It comes in both Clear and Wood Mount options. As always, before starting with any product, I like to have a little look online to gather some ideas to aid the flow of inspiration and I must say Pinterest did not disappoint, this is clearly a much-loved set! ​As i mentioned earlier, my challenge is to make a number of projects with each stamp set and this is my favourite card from my first play with this set! This card is made from a card blank measuring 4, 1/8" x 5,3/4" that I have cut from an A4 sheet of Crumb Cake A4 Cardstock. The Black and White Striped DSP is from the Petal Passion​ collection. 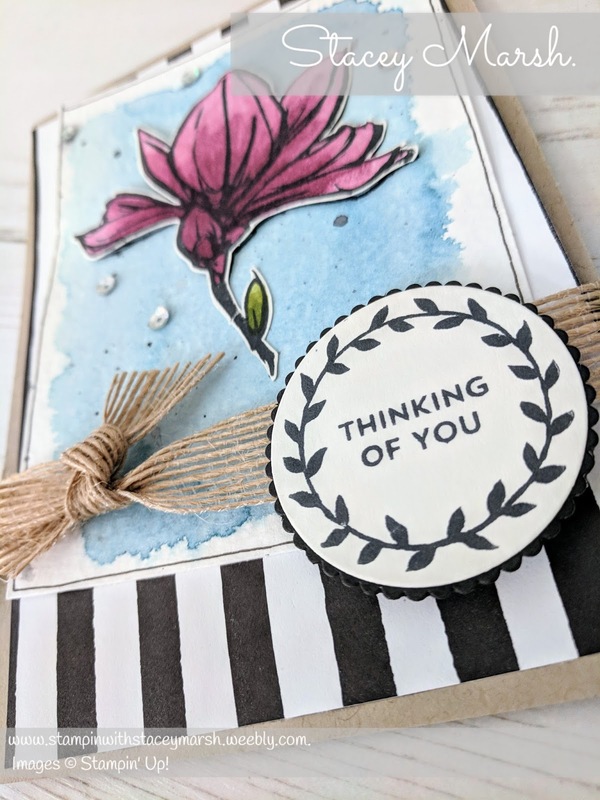 To create the blue background I have spritzed some Watercolour Paper ​and added a wash of ink from a Marina Mist Classic Stampin' Pad using an Aqua Painter ​and dried with a Heat Tool. To create the black dots I have splashed from a distance some Basic Black Archival Stampin' Pad on the tip of an Aqua Painter. I have stamped the flower using a Tuxedo Black Memento Ink Pad onto Very Vanilla A4 Cardstock and cut around it with scissors, leaving a small outline. This has then been coloured in using Stampin' Blends and attached to the background using Stampin' Dimensionals to give some added dimension. I have tied some 5/8" Burlap Ribbon around the card and secured with some Tear and Tape Adhesive to keep in place. My usual stamping style is to stamp directly onto White / Vanilla but I really do think the combination of the Blue and Purple makes the flower pop! Thanks for reading ladies and gents. If you would like to try out any of these techniques I have tried on this card, why not try one of my classes?